Bexx Hunt tripped over her family’s pet dog and fell down the stairs fracturing a vertebrae in the process. A mom was almost paralyzed after tripping over her dog and falling down the stairs in a freak accident. 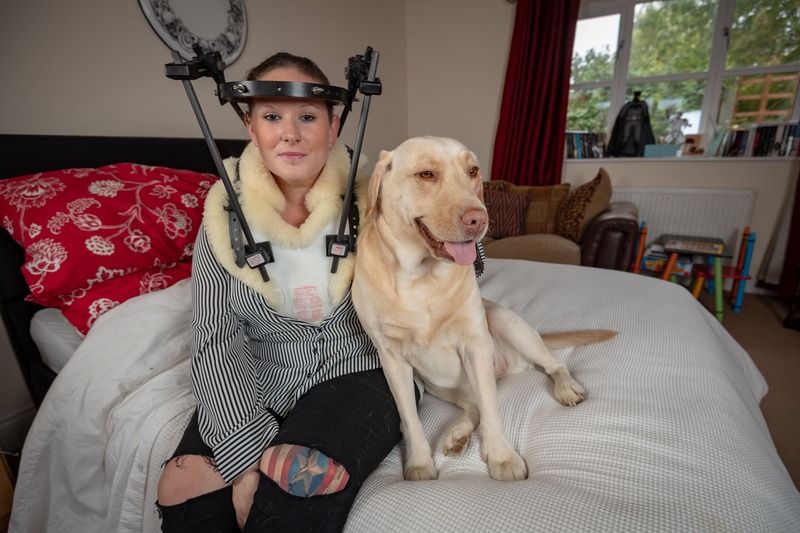 Bexx Hunt (corr), 28, broke one of the vertebrae in her neck after tumbling over golden labrador, “Tequila,” when she got up in the night to use the bathroom. She was told by doctors that if the break had been in a different bone, she would have been left paralyzed. Hunt must now wear a halo neck brace screwed into her skull for the next three months while her injuries heal. Hunt’s partner Neil Morby, 44, slept through the fall, despite her calling for help from the bottom of the stairs. She somehow managed to get back up the stairs to bed, only realizing the extent of her injuries the following morning. Morby, a project manager, quickly called paramedics who rushed to the couple’s home in Great Waldingfield, Suffolk. Hunt didn’t realize the extent of her injuries until she woke up the next morning and was unable to move her neck. Hunt, mom to 4-year-old Joshua, was strapped to a backboard and taken to West Suffolk Hospital where her injuries were assessed. But when doctors realized she had broken her C2 vertebrae, they immediately transferred her to Addenbrooke’s Hospital in Cambridge for specialist care. Hunt, who works in sales, is now recovering from the fall at home – with pooch Tequila, who she insists isn’t in the doghouse. Hunt wants to thank medical staff who helped her following the freak accident on September 30. Hunt is now fundraising for the East of England Ambulance Service. April 5, 2019 Comments Off on Gender pay gap: Can it be fixed?